A recent poll from Newman University and YouGov found that one in five British atheists and over a third of Canadian atheists agreed with the statement: "Evolutionary processes cannot explain the existence of human consciousness." Of the non-religious--those who aren't explicitly atheists but don't identify with any faith--34 percent in Britain and 37 percent in Canada agreed that evolution cannot explain the mind. In his book, "The Reason for God," Tim Keller invites skeptics to explore these suspicions. 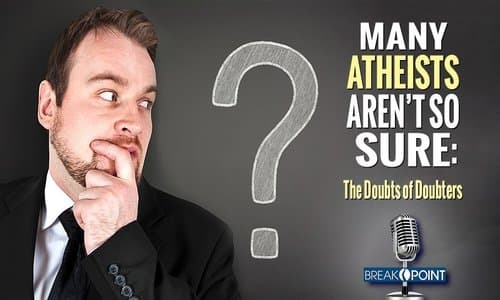 These folks, he writes, should "doubt their doubts," reexamining their objections to Christianity and looking for the hidden beliefs underneath each. As C. S. Lewis might say, atheists really can't be too careful. He argues in "Mere Christianity" that it's normal for believers to sense that the Christian faith looks "very improbable." But these moods aren't unique to believers. "When I was an atheist," he confesses, "I had moods in which Christianity looked terribly probable." That's why Lewis defined faith as "the art of holding on to things your reason has once accepted, in spite of your changing moods." It's also why Christians shouldn't be afraid of reason or evidence. We should engage our doubts with confidence that our worldview--unlike the secular one--has the resources to explain both the natural and the supernatural aspects of the human experience. In both cases, doubt--counterintuitively--can lead to faith.